Ref No Grave or Memorial / Rhif cyfeirnod bedd: XV. L. 2. Killed in Action 14th October 1918. 28 days before the War ended. David Roberts was born around 1895 in Manchester according to the 1901 census. He and his family were living at Chester Road, Shotton, Hawarden. The head of the household was David Roberts (Snr), 31, a Stationary Engine Driver who had been born in Llangollen, Denbighshire. Margaret Roberts, 36, had been born in Holywell, Flintshire. Their listed children were Edward, 7 and David, 6. Both boys had been born in Manchester. The 1911 census records the family living in Cambrian View, Sandycroft. David (Snr), 41 was still a Stationary Engine Man. His wife of 18 years, Margaret was 45. 2 children had been born to them, both were still living. Edward, 17, was an Engine Fitter’s Apprentice and David, 16 was an Iron Turner’s Apprentice. UK, Soldiers Died in the Great War, 1914-1919 accessible on www.ancestry.co.uk confirmsDavid’s regimental information and tells us that he was born in Manchester, his residence was Sandycroft and he enlisted in Chester. His medal card, also on’Ancestry’ details his medals. There is an index card for David in The Flintshire Roll of Honour in The County Record Office in Hawarden. (Card Sandycroft F8 ) gives the address Cambrian View and tells us his period of service was 3 years 10 months and that he died at Ypres. The card was signed by his brother Edward Roberts on the 23rd September 1919. 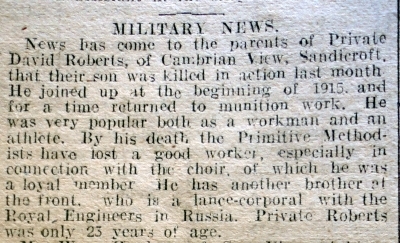 Military News – News has come to the parents of Private David Roberts, of Cambrian View, Sandycroft, that their son was killed in action last month. He joined up at the beginning of 1915, and for a time returned to munition work. He was very popular both as a workman and an athlete. By his death the Primitive Methodists have lost a good worker, especially in connection with the choir, of which he was a loyal member. He had another brother at the front, who is a lance-corporal with the Royal Engineers in Russia. 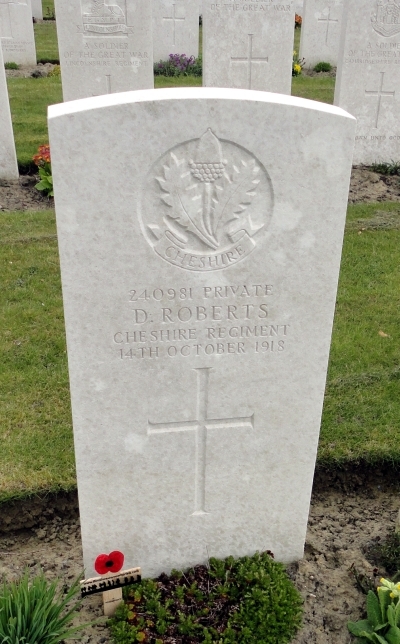 Private Roberts was only 23 years of age. David is remembered on the Sandycroft War Memorial in St. Francis’s Church and also as (Pte.) (Cheshire Regt) on the Queensferry School Roll of Honour in the Queensferry War Memorial Institute. David Robert’s Gravestone, photo taken on the 11th April 2015 by Mavis Williams.